Charles Darwin has been extensively analysed and written about as a scientist, Victorian, father and husband. 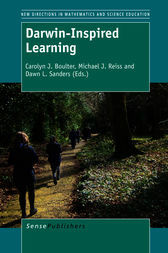 However, this is the first book to present a carefully thought out pedagogical approach to learning that is centered on Darwin’s life and scientific practice. The ways in which Darwin developed his scientific ideas, and their far reaching effects, continue to challenge and provoke contemporary teachers and learners, inspiring them to consider both how scientists work and how individual humans ‘read nature’.Darwin-inspired learning, as proposed in this international collection of essays, is an enquiry-based pedagogy, that takes the professional practice of Charles Darwin as its source. Without seeking to idealise the man, Darwin-inspired learning places importance on:• active learning • hands-on enquiry• critical thinking• creativity • argumentation• interdisciplinarity.In an increasingly urbanised world, first-hand observations of living plants and animals are becoming rarer. Indeed, some commentators suggest that such encounters are under threat and children are living in a time of ‘nature-deficit’. Darwin-inspired learning, with its focus on close observation and hands-on enquiry, seeks to re-engage children and young people with the living world through critical and creative thinking modeled on Darwin’s life and science.